If you see the bike for the first time, you may probably have concerns that the bike may be more dangerous than a traditional bike. This is because the head is placed forward and because you may think that you cannot see the road. If you have a frontal crash by using the H-zontal bike or a traditional bike the crash will be not much different. With a H-Zontal bike, the body may be better maintained by the hips supports and the pedals which acts like a seatbelt and the front wheel will take the crash first and not your head. How do you see the road ? To see forward, you can easily lift up your head. 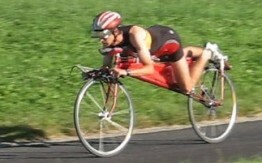 You'll have the same vision as in a classical racing bike. For a long straight run (more than 50 meters) you can use the mirror system. The vision of the road is as wide as a panoramic angle of a car`s windscreen. This mirror system is now integrated in the goggles to reduce the vibrations of the image. The mirror covers only 1/5th of the real vision so you can see directly up and down, by only moving your eyes. How could you be seen by cars ? When motorists approach from behind, the moving pedals are enough to attract their attention. Since these are situated at a higher level than in a normal bike, this fact enhances their reflex to surpass at a larger distance. How will you do to stop? It is so easy, at any moment your foot can be dropped naturally on the ground, because the hip support is conceived at an ideal height. When you are in a pedestrian area, you can easily walk on pushing the bike while still sitting on it.